Ping pong or table tennis is a game that most of you have probably played, even if you’re not too familiar with the exact rules. It’s a great casual game to play with friends, and it’s perfect for a bit of entertaining recreation. However, unlike other similar casual games, it can’t be played just anywhere. Sure, you can try to play it on a regular table, but it will be difficult. Believe me, on that; I tried it more than a few times in college to no avail. For the best experience, you need a proper ping pong table. 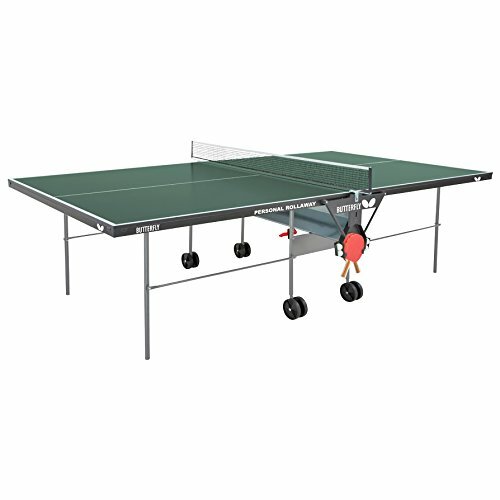 What separates a ping-pong table from a regular one is not just the small net in the middle or the fact that it can be easily assembled and disassembled. The materials it is made of also make a huge difference in how the ball bounces and that’s why it’s so easy to play on them. Buying one might seem like a difficult task if you’re not familiar with them, but today I’ll give you some advice on how to do that, while also offering you my opinions on a wide selection of the best ping pong tables on the market. 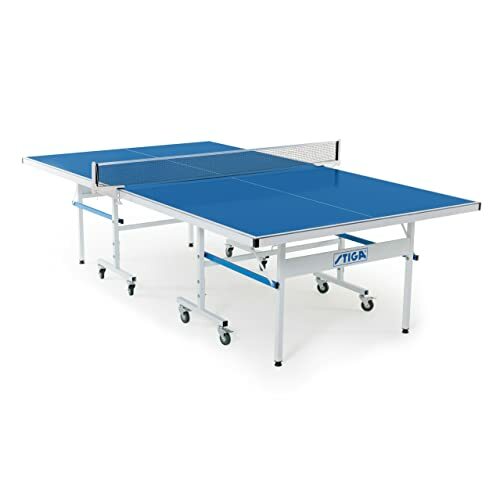 8 What to Look for When Buying Ping Pong Tables? This is a great table that both professional and casual players can use. It’s made out of high-quality materials, and it is quite sturdy. It features a standard-issue 1-inch thick surface and a competition grade 9-by-5 size. If you’re a pro or intending to become one, this is a great practice table that you can get for a decent price. It’s great for casual players because it’s ridiculously easy to assemble once it arrives and it’s equally easy to fold up and store when you don’t want to use it. It can take up quite a bit of space due to its heavy duty construction, though. Speaking of construction, there are some slight flaws when it comes to that. The two sides of the table don’t line up perfectly, even when the net is added – one sits just slightly above the other. The net acts as a connector and has to be removed when the table is folded up, which might also pose a problem. Overall, though, it is a great indoor table for almost any player out there, and you should check it out. The price is a bit high, but it is more than worth it. This product is almost perfect for beginners and casual players because it’s easy to set up and it can withstand a decent deal of punishment. The setup process shouldn’t take more than 10 minutes, and you can fold it up with equal ease. The construction of this table is quite light, meaning that it’s highly portable. If you want to move it to another room or somewhere else, it should be quite simple and almost effortless. Despite that, it’s quite durable – the net and the surface can take a good deal of punishment before showing any signs of wear and tear. The surface is of decent thickness, 5/8 inches in total, but that’s more than enough. It might not satisfy professional players looking for 1-inch thickness, but this is not a table made with them in mind. There is a problem with the surface though – it stains easily. Just make sure not to put wet or sweaty fingers on it, and it should be fine, but it might be a problem otherwise. The corners are of poorer quality than the rest of the table, and they can get damaged easily, so watch out. Besides that, it’s quite a great table at a decent price so if you’re a beginner looking to get into the sport I say – go for it! I think this is one of the best tables for purely casual players due to the fact that it’s incredibly simple to set up and it doesn’t take up a lot of space. It is easy to fold up, and you won’t have trouble carrying it around since it’s exceptionally light. It also has a sleek look that is able to fit in with almost any décor so it will enhance the appearance of any room even when it’s not in use. The size of this table is far from standard though, so it’s not recommended for professional players. The thickness of the playing surface is 5/8 inches, again quite far from the standard but more than fine if you’re not concerned about that sort of thing. I found this to be a sturdy table for the most part, and it could take a lot of punishment, but the playing surface is a bit flimsy. It’s too prone to staining as well as scratches and the like, so you need to be extra careful with it. The price is a bit high to be sure, but due to how good the product is I think it might be worth it. If you’re on a budget though, you should probably take a look at something else, but otherwise, this is more than worth a consideration. 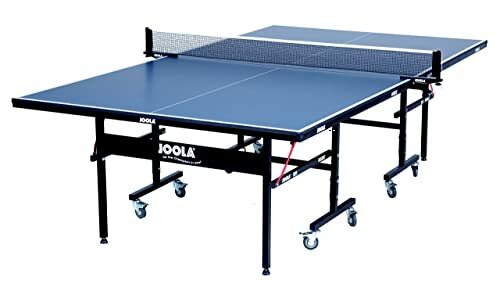 I do consider that this is one of the best ping pong tables that you can get if you intend on practicing for going pro. It’s made to tournament-standards with a 9-by-5 playing surface though the surface is only ¾ inches thick, but that’s not a huge problem. One of the best features this table has are the corner ball holders which are incredibly convenient, especially for solo play and practice. If you intend on practicing your serve a lot, this allows you to do that without the need to pause and get the balls – they’re right at hour fingertips. The light but sturdy construction of this table is another plus in the positives column since it can be easily set up or folded back up and doesn’t take up a lot of space while also being highly durable and sure to last for years. The only flimsy parts are the magnetic scorers that come with the table. They’re simply not good and bound to fall apart soon. However, this is still a great table, and the price is right for something of this quality so you should definitely take a look at it. If you intend to practice a lot, this is one of the best tables around. While the thickness is not as great as you might expect, at only 5/8 inches, the surface is just great and incredibly sturdy. It can take a lot of punishment without showing signs of wear and tear, allowing you to practice as much as you want. The table can even be set up for a solo practice mode. As far as the size goes, it is made to regulation standards, and it doesn’t take up a lot of space when it’s folded up. It’s easy to unfold as well, so you don’t have to worry too much about the setup and clean up. Overall, the construction is sturdy as well, and it should last for a long time. However, the screws might need to be replaced after a while since they’re not up to snuff. Other than that, this is quite a reliable table, and it comes at a more than acceptable price. It is well worth checking out. This is an incredible outdoor table that comes with an amazing set of accessories included with it at a reasonable price. 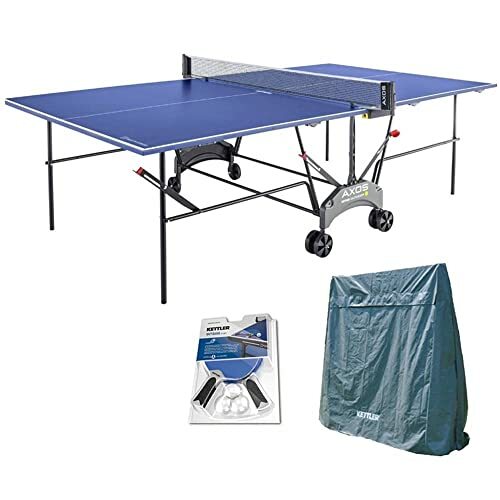 Besides the table, you also get two great paddles, a 6-pack of 3-star balls and an outdoor cover. For the price on offer, that’s more than good. I know a lot of people like their tables to be regulation-standard in size and this one is, with a 9-by-5 playing surface. The thickness is only 0.87 inches, but that’s still quite good and not that far off from the 1-inch standard that a lot of players crave. The ball bounces quite well on the surface and evenly on all parts of it. This is quite a weighty table though, but it is also a sturdy one and perfectly weatherproofed. All parts are resistant to both moisture and heavy UV light, so you don’t have to worry about much when you take it out to the yard. The top is also made to reduce glare so you won’t have any problems playing in the sun. I found only one major downside to this table, and that’s how difficult it is to set up. You might have a different experience, but to me, this was quite a chore. Still, it’s a high-quality product that more than worth its price. This is a great versatile table that can be used equally well for both indoor and outdoor play and it excels at both. It’s made to be sturdy but not too heavy, and the construction is quite reliable. Everything is properly weatherproofed, including the net and the metal parts are resistant to rust. It is made to last and withstand almost everything you do to it. In addition to that, it’s also quite easy to set up, and I had no problem whipping it out in a matter of 10 minutes and starting to play – which means you certainly won’t have troubles with it. It’s made to fit tournament standards so it can also be used as a good practice table and the ball bounces well on the surface. Unlike most outdoor tables it can be used for practice by professional or those who want to become one. The only major downsides are the poor quality of the paint and the net, which is too short and doesn’t cover the entire width of the table. If you’re able to deal with those small problems, this is a great indoor and outdoor table. Again, here’s a table that’s well-suited to both indoor and outdoor play. However, I find that you should probably use this one for outdoor play more since it’s better for that purpose. If you’re buying it for indoor play, there are better products you can get. For outdoor play, you’ll find it to be great due to high-quality weatherproofing and sturdy construction that won’t fail you. If you’re looking for something that will last and doesn’t cost a lot, this is a good choice. The only part that’s not sturdy is the protective cover that comes with it – it is easy to tear, and you’re better off buying a different cover as soon as possible. Another significant downside to the table is the initial set-up process. I need a few hours to set it up, and you might need even more if you’re not handy enough. It is easier to fold and unfold later on, so that’s a short-term problem. It also takes up little space when it’s folded up so you won’t have problems storing it. Overall, it’s a decent product with a few kinks that need to be worked out. I know this is a table that’s a bit more expensive than average, but I found it to be worth the price. One of the main reasons why you might like it are all the great accessories that come included with it. It comes with two great paddles a set of six 3-star balls and a protective cover – you have everything you need to start playing straight away. The ping pong paddle is especially good. It is also an exceptionally sturdy table that has a great 3-year warranty. It’s not likely that you’ll have to use it since all parts of this table are made to near-perfection and are as sturdy as they come. You will need to put in a lot of effort to break anything, so accidents are not a problem. It’s great for beginners that drop paddles on the surface. You know that most sturdy tables are heavy, but here that’s not the case, and this is one lightweight table that you’ll be able to fold and unfold with ease while also carrying it wherever you might want. The paint on the surface is the only part which might be damaged after some use, but other than that this is almost a flawless product. This Stiga ping pong table is one of the best mid-range products you can find right now, as far as outdoor tables go. The best part about it is probably how durable it is, and it can withstand the elements without a lot of trouble. The only slightly questionable part of the construction is the tabletop which is a bit thin for my liking, but you might not have any problems with it if you’re just a casual player. Overall, the table is extremely easy to put together, and you can put it away with equal ease when you’re not using it. It won’t take up a lot of space, and you can carry it everywhere without needing to be a strongman. The price is decent, and the only large complaint I might have about the table is the fact that the edges are a bit too sharp for my liking. You should be careful when playing since you might cut yourself on them if you’re not careful enough. Other than that, this is a good outdoor table that you should check out. 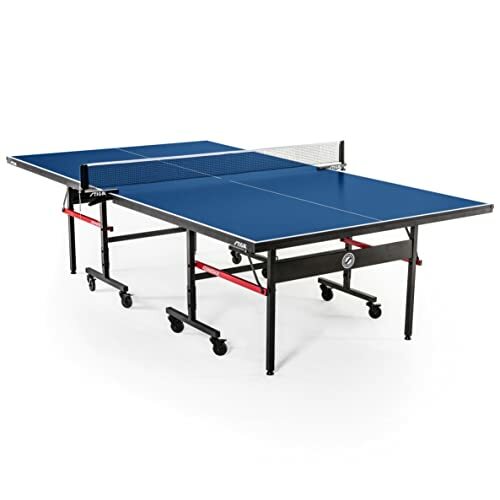 Unlike my other Stiga ping pong table reviews, this one will lean a bit more on the negative side due to my experiences, but I still think this is a decent product and one of the best ones around so don’t be dissuaded. The main reason for that is the weatherproofing – this is billed as an outdoor table, but it won’t properly withstand the elements. I like it overall, but you should probably keep it indoors if you buy it. The reasons I like it are numerous though. The tabletop surface is great, and despite the low thickness, it is still quite playable, and the bounce is even on all portions of it. It is also highly resistant to scratches and other damage. Another reason I like and you might as well, is the anti-tilt feature which is bound to stop a lot of misplays that would otherwise happen, thus improving your experience. Also, aside from the weatherproofing problem, this is quite a sturdy table that’s well worth the price. Just don’t take it outside as often as you might have otherwise. If you’re looking for great quality and aren’t afraid to pay a good amount of money for it, you should look no further – this is probably the ideal table for you. This Butterfly table is more than able to withstand a lot of punishment and comes with a great 3-year warranty included in case something goes wrong. It is made with a high-quality 3/4-inch table top with a good steel railing rim and perfectly balanced 1-inch steel legs. Despite that, it’s quite light and portable if you need to carry it around. You will also find it easy to fold up and store since you don’t need to remove and place the net each time and it takes up almost no space when folded up. Another great feature that you will most certainly find a use for are the accessory holders. They are perfect for storing a ping-pong paddle or some balls for quick use, so you won’t have to worry about that. I used a Killerspin ping pong table simply because it had them, but this one proved to be better. The only major downsides are the high price and the fact that it doesn’t fit tournament standards exactly. However, if you’re not a pro, this is a great table for you. This is certainly a table that lives up to its name since it is bound to save you a lot of space in your home, even if you’re using it to play all the time. It measures in at only 71 by 40.5 inches, and it is no more than 30 inches tall, but still great for a bit of casual play. When it’s folded up, it takes even less space than that. There is virtually no assembly required as well. You will find that all of this makes it an ideal table for parties or college dorms and it is made for casual play and a bit of fun. You can even take it outdoors if you want, but beware since it’s not weatherproof. The table halves can be used by themselves as well, for something other than ping pong. It would be almost perfect if it came with everything you need to start playing, but alas, that’s not the case. That makes the price a bit high, but the quality here is exceptional, so it is worth it. However, there are some flimsy parts – the net posts are the largest sore spot in that regard. Overall, this is a great table for casual play that saves you a lot of space, and that’s why it’s worth buying. You are in luck if you’re looking for a regulation-sized table that won’t set you back by much but is still quite well-made. This is a ping-pong table from a company that’s quite overlooked but makes a lot of decent products, and this is no exception. Most parts of the table are well-made and sturdy, and it comes with a 1-year warranty so you can easily fix any problems which might occur. However, it’s unlikely that anything will break or chip and everything seems top-notch. The only exception is the net which sags quite a bit and won’t stay up properly, so you’ll need to get a different one. The most severe problem with this table is the tiling. You need to make sure you place it on a perfectly flat surface, or you won’t have a great time, and it can easily tilt or tip over. Watch out for your feet when playing a fast and rough game. However, it is still a quality product made to fit most competition standards, and it comes at a lower price than most similar products which make it well-worth the money. 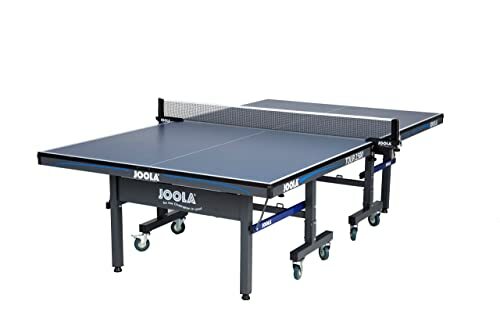 This Joola ping pong table is one of the most compact products on the market right now but it is not a toy, and it offers great construction quality. The size of the table is only 72 by 36 inches while it takes up only 36 by 36 inches when folded up. Putting it up or folding it up takes practically no effort and it is exceptionally light. The durability of this product is quite good despite what you may think when you look at it. Most tables of this size are quite flimsy but this one is not, and it is bound to last for a long time if you take proper care of it. Don’t take it outside since it’s not weatherproof. You should take a good look at it when it arrives, though. It comes pre-assembled, but some screws might still need a bit of tightening up, and you should have no problems if you do that straight away. It is a negative though. Overall, it’s a great small table that will bring you loads of fun. Not for kids though, it’s too high for them. Otherwise, it’s a good, affordable product. 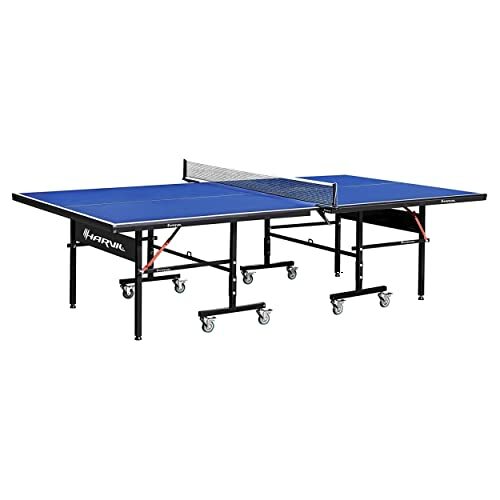 You thought you couldn’t get a decent full-sized ping pong table for under 200 dollars? Well, you thought wrong and this is the product that proves it. It comes in the standard size, and the tabletop is of the standard thickness while the entire table doesn’t weight a lot and is easy to store away when you’re not using it. It’s the perfect practice table for a casual player looking to practice and work towards going pro. If you’re not sure if it’s worth the price, you should know that it comes with two paddles and six balls included as well – everything you need to start playing straight away. Well, that might take a while though. The initial set up is difficult, and the instructions included with it are quite bad. However, once you get over that hurdle, it should be easy to set up and fold up every other time. One thing that’s not clear about it and that I learned once I got it is that it’s made out of 4 pieces, something that a lot of players won’t like. However, this is still a great product for the price, and if you’re looking for a full-sized table for a budget price, this is the best pick. As far as I’m concerned, this is flat-out the best product on the market right now and I’m here to tell you why that is. First off, this is a table made with professionals in mind, though casual players can use it as well. It fits all the possible USTTA standards and is often used for competitive and tournament play in the US. It has a 1-inch top that’s scratch proof, and the size is a perfect 9-by-5. The durability is top-notch, and nothing seems to be able to touch this table when it comes to that. Even if something does break, which is unlikely, you get an amazing 5-year warranty with this product which just shows how much confidence the manufacturer has in the quality of their product. For the picky players, the table is made out of one foldable piece, meaning that you will have no problems with misaligned table halves ever again. There are no problems with tiling on uneven surfaces either due to the highly adjustable table feet. If you’re worried about the difficulty in assembling it – don’t be. It comes pre-assembled for your convenience, and you can just take it out and start playing straight away. The only notable complaints about this table refer to the price, which is quite high but more than worth it. Another common complaint refers to the high weight, which is true, but due to the quality and the complexity of the construction that is to be expected. Overall, this is the best ping pong table I have ever used, and I believe it is the best one on the market right now. If you have the cash for it, you should most certainly buy it over all others. All of the tables I reviewed here have some merit, one way or the other, but some are certainly better than others. That brings up the burning question – which table is the best one out of them all? 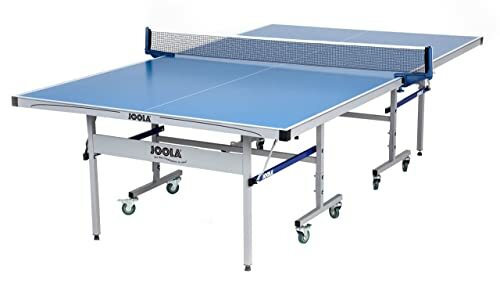 Well, as far as I’ concerned I’d say that the best ping-pong table overall would be the Butterfly Personal Table Tennis Table. It boasts incredible quality and durability and it is one of the best products out there right now. You even get a 3-year warranty with it in case something goes wrong, but it most probably won’t. It has amazing versatility with the accessory holders that most other tables don’t have and it can be folded up with less effort than other products. It is great for both casual players and professionals with its great, even surface and stability combined with the ease of setup. There is more to it, but all of these features just put it a rank above the rest and make it the best product here, in my opinion. Yes, it does have a few flaws and it does cost a lot but I would say it is well-worth the price – you shouldn’t be afraid to pay a little bit extra for supreme quality. If you get this table you won’t have to get another one any time soon or spend any money on repairs. 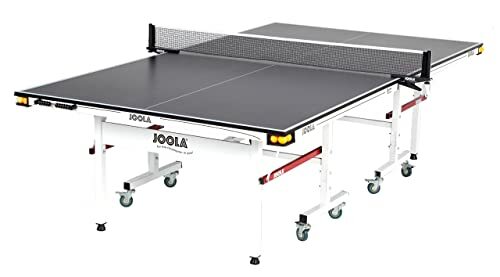 Overall, this is the best ping-pong table you can get right now and I think there’s no reason to think twice before buying it. 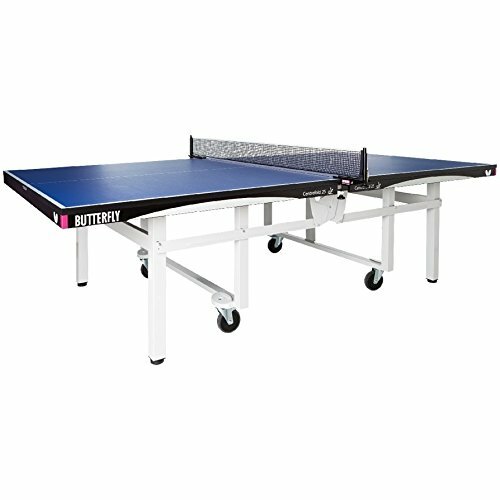 What to Look for When Buying Ping Pong Tables? 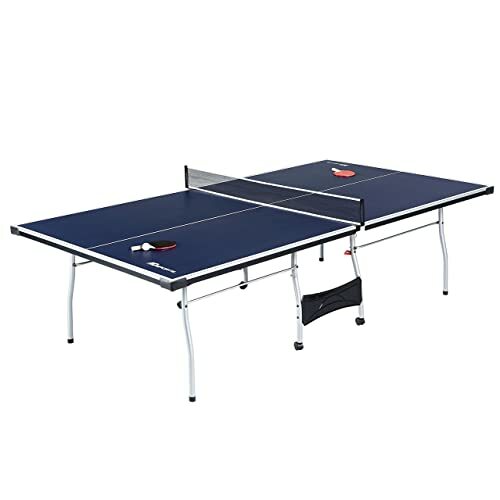 If you’ve never owned a ping pong table, it’s understandable that you’d be a little confused when buying your first one. You might even know a bit about them, but you still aren’t sure what your ideal table should be. Well, here I’ll outline a few things you need to consider when purchasing a ping-pong table to make sure you get what you want. 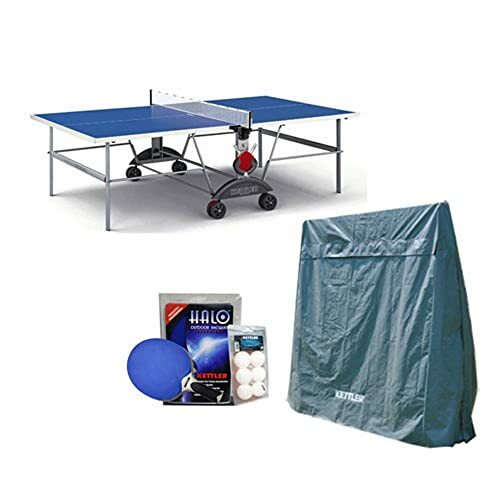 This is one of the most important choices you need to make when purchasing your ping pong table – do you want to play just inside or outside as well? Ping pong is usually played indoors, and any table can theoretically be taken outdoors for a short while on a nice, sunny and dry day – but that’s less than ideal. If you want to primarily play outside and use your table for house parties, for example, then you need to get an outdoor table. The difference between the two is in the sturdiness of the build as well as the weight. Outdoor tables are generally made to be more resilient than indoor ones and are usually weatherproof and waterproof. Another prominent feature is the weight – they usually have steel or concrete undercarriages to stop them from swaying in the wind and affecting play. Naturally, all of this makes outdoor tables more expensive than indoor ones but far less portable and compact. There are cheap outdoor tables as well, but they compromise but having poor playing surfaces. Overall, you should buy an outdoor table only if you’re sure that it will stay there most of the time. Otherwise, you should probably opt for purchasing and indoor table that you can occasionally take out when the weather is good. Not all ping pong tables are collapsible. If you’re a casual player and you don’t want the table to constantly take up space, getting a collapsible one is a good idea. 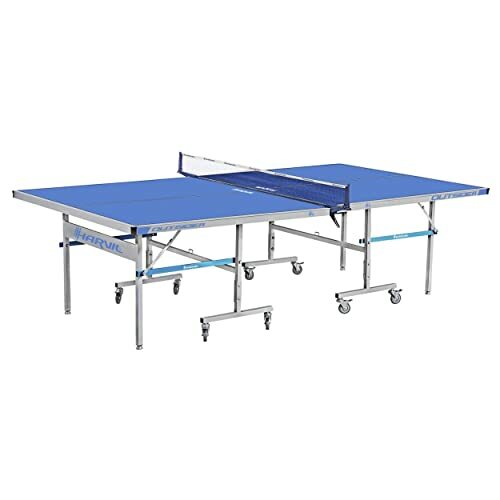 However, in case you want to play seriously, you probably need to get a non-collapsible one since most regulation tables are made out of one continuous surface, a feature that most collapsible tables don’t have. Consider the amount of space you have and pick accordingly. The thickness of a table’s surface greatly affects play and the amount of bounce that the ball has. Most players will say that the only tables you should buy are those with surfaces that are 1-inch thick, but that is not necessarily true. Tables with a thickness of 0.75 or 1.25 inches are also decent, and if you do not intend to play seriously, almost any thickness will do. Just remember that the ball bounces better on thicker surfaces. It’s also generally accepted that thicker tabletops = better quality since it will take longer to wear out. So, if you’re intending on playing a lot but not playing professionally, getting a thick table is probably your best bet. The usual and standard size for a ping-pong table is 5 by 9 inches, and you should get a table of that size if you’re intending on playing seriously. However, if you’re a casual player, I recommend that you get a smaller table that’s more compact. 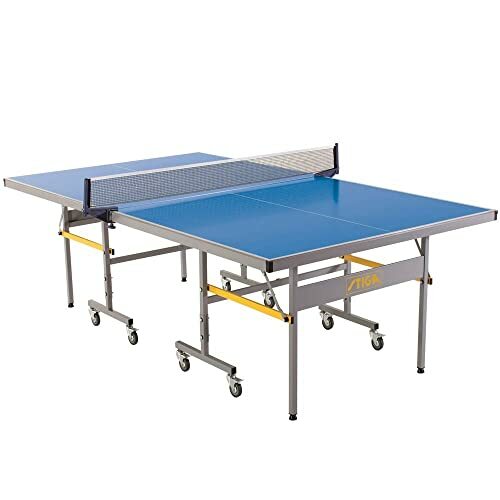 If you intend on playing doubles, though, you should buy a table that’s slightly larger. Keep in mind, though, that larger tables will cost more. This is not a factor you need to consider if you’re purchasing an indoor table that you don’t intend to take outside. However, if you do wish to play outside, even for a short while each day, you should take this into consideration. Weatherproofing refers to the ability of a table to withstand all possible weather conditions with minimal damage. This doesn’t only refer to moisture and rain, but also cold and heat as well as direct sunlight and more. Water isn’t the only thing that can damage your table – even if it’s nice and sunny outside the heat and direct sunlight can warp the playing surface, making the table unusable. Because of that, taking strictly-indoor tables with no weatherproofing outdoors is not advisable. Last but not least is your budget. You should pick something that’s within your means, but you shouldn’t compromise on quality. If you’re not willing and able to spend at least a few hundred dollars, I think you should hold off on buying a ping pong table. Getting a bad but cheap table is just a waste of cash. 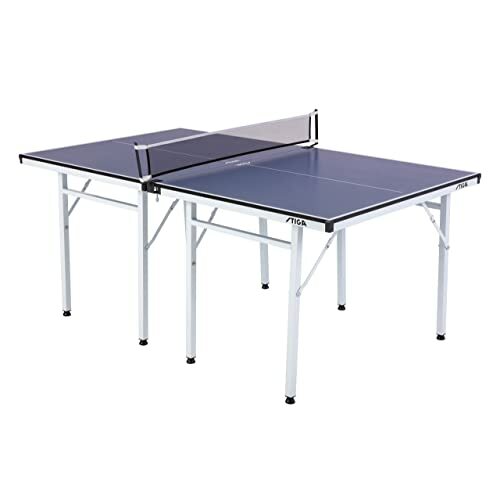 See table tennis conversion tops also save your money and space. Now you’re equipped with all the knowledge you need about ping pong tables, and you know a lot about my opinions on the best products on the market. You don’t have to follow my advice, but you should now be able to choose the ideal table for you with a problem. If you like the article and know anyone else, who could use some help about this subject, feel free to forward it to them. 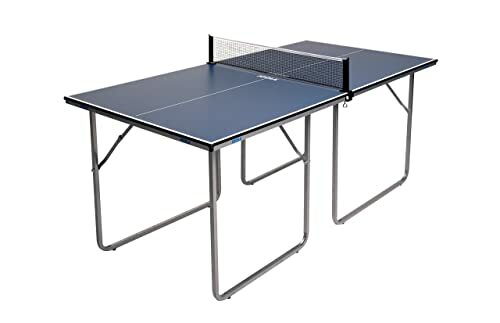 If you have any opinions about ping pong tables, share them in the comments, I would like to hear some of your thoughts! Overall, I just hope this article was helpful and that you’ll visit me again. Until next time!